What’s up, Karma Nation!? We have some great news for you! If you’re thinking about joining the Karma Nation, use Promo Code “STRIKEOUT” to get 10% of ANY package for the lifetime of that subscription! Click here for our packages. I don’t love Cole Hamels over the entire season, but there are limited viable pitching options tonight. We also know what we’re getting from him. He enters this game with a 2-0 record, 3.79 ERA, and 1.00 WHIP. His ERA nearly matches his 3.80 xFIP and 4.02 SIERA, suggesting this is what we’re getting with Hamels. His strikeout rate is down a bit this season, but he gets a matchup against the Miami Marlins, who rank third on the slate in strikeouts per at-bat. Miami also ranks second last on the slate in team wOBA. Furthermore, Hamels will be throwing in an extremely pitcher-friendly stadium with a pitcher-friendly umpire behind home plate. He posted 29.6 DK points in his last game, and comes with similar upside tonight. Hamels is a -156 favorite in a game set at 8 runs, giving the Marlins an implied run total of only 3.6 runs. Jason’s Reaction: Cole Hamels is my second favorite pitching option tonight. This is a boring recommendation, but it must be done. The pitchers on tonight’s slate are mediocre at best, but Jake Odorizzi at least comes with quite a bit of strikeout potential. He currently sports a 9.3 K/9, and the Toronto Blue Jays strike out more than any team playing tonight at 0.28 SO/AB. 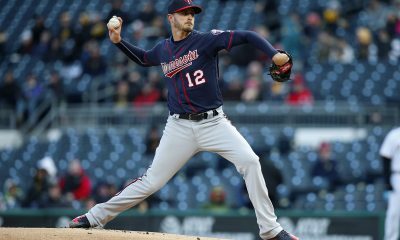 It will be under 50 degrees tonight in Minnesota, which should also bode well for pitchers, and at his current price tag, Odorizzi only needs to be serviceable. He is allowing a worrisome 42% of batted balls as fly balls, but his average batted ball distance is down 29 feet from his 12-month average to 191 feet. Odorizzi pitched a gem to start the season at home, and after that, he struggled on the road twice. He is back home tonight. Will he bounce back? We shall see. Justin’s Reaction: This is a relatively bad pitching slate, but Odorizzi makes a lot of sense. He’s one of my favorite options, as well. It looks as if I’m also utilizing a mini-stack in this article, but I’m on the opposite side of Jason. Justin Bour has been heating up a bit recently, scoring double-digit fantasy points in three of his last four games. He has also posted 44% hard-hit and 38% fly ball rates with a 93 MPH exit velocity over the last 15 days. Bour gets a plus matchup against Lance Lynn, and he brings 0.055 wOBA and 0.122 ISO differentials against right-handed pitching into this game. Lynn has been playing better since his first start, but he hasn’t been the same pitcher since the start of the 2018 season. Bour is expected to hit third in the Los Angeles Angels lineup, and he’ll see a major boost from the ballpark and weather (as Jason outlines below). Jason’s Reaction: Attacking this game is so smart tonight. I think attacking Harvey is the better move, but I also like this recommendation. Danny Santana is the infield part of the mini-stack I’m recommending tonight. Matt Harvey is on the mound tonight, and he is currently allowing 1.6 HR/9, suggesting the Texas Rangers should score some runs tonight, especially considering the weather. It will be over 75 degrees tonight in Texas, the wind is expected to blow around 15 MPH from right field, and the humidity is approaching 0.8, the highest on the slate. In the last 15 days, Harvey is allowing a 63% hard hit rate, which is great for Rangers. His average exit velocity is 99 MPH! That alone is reason enough to roster Santana. Over the last 15 days, Santana is averaging 243 feet per batted ball, an exit velocity on those batted balls of 92 MPH, and a 55% hard hit rate. His fly ball rate is also rather high at 55%. While a home run is not likely, it is possible. Add in that Santana is hitting second in the order and has stolen base potential, and he turns into an elite DraftKings’ option. Justin’s Reaction: Santana’s speed has been on full display in his limited games this season, and he makes a strong option on this slate. The second part of the stack is Kole Calhoun, who is too cheap for the situation he’s in tonight. He’s playing in a game set at 10.5 runs, and his team owns an implied run total of 5 runs. He’s also leading off for the Los Angeles Angels, potentially giving him extra at-bats tonight. While Calhoun’s numbers don’t pop off the page, he owns 46% hard-hit and 38% fly ball rates with a 97 mph exit velocity over the last 15 days. He also brings 0.015 wOBA and 0.088 ISO differentials against right-handed pitching into this game, and we know that he gets a plus matchup against Lance Lynn. Calhoun is far too cheap for a leadoff hitter with plus splits in this game. Jason’s Reaction: I recommended Calhoun on Monday, and I still like him. What can I say? I’m a consistent kind of person. Shin-Soo Choo is the outfield part of the mini-stack I’m recommending tonight. See Danny Santana for information regarding Matt Harvey. 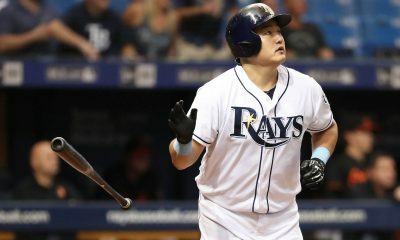 Choo is coming into this game with 0.121 ISO and 0.106 wOBA differentials against right-handed pitching. Again, the weather is great, and refer to Danny Santana for analysis. 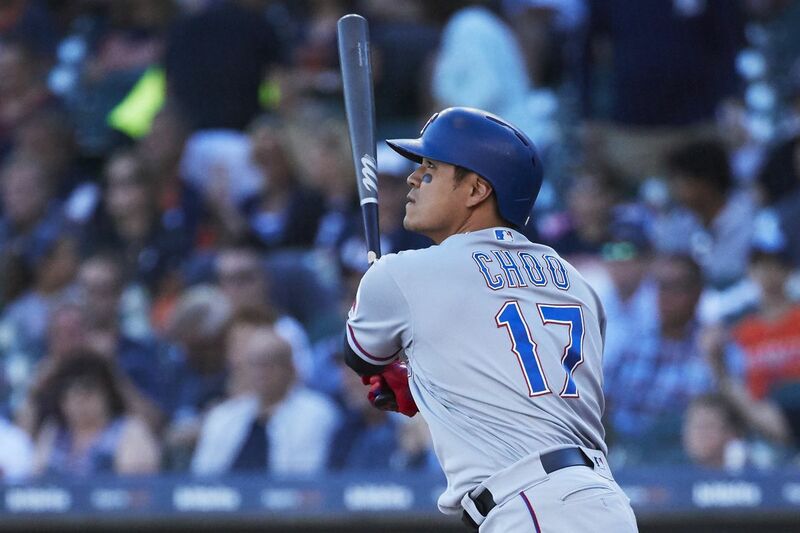 Over the last 15 days, Choo has an average batted ball distance of 254 feet, an average exit velocity of 98 MPH(! ), and a hard hit rate of 62%. 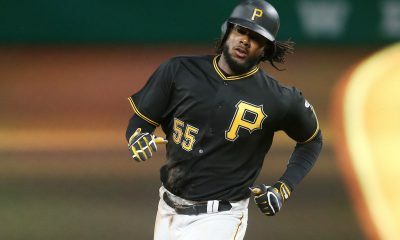 On the season, he is hitting .327 with one home run and six RBIs. As a leadoff batter for the Texas Rangers, he should see additional at-bat opportunities, and the stolen base is always a possibility. Ranger up tonight, KarmaNation! Justin’s Reaction: This was going to be my play tonight, so I absolutely love it. Get him in your lineups.